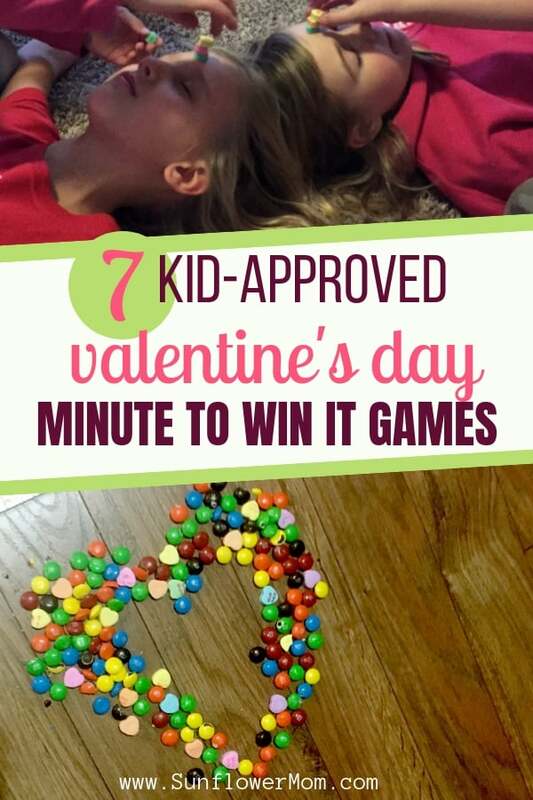 Inside: 7 of the best Valentine’s Day minute to win it games for kids. Spend $5 on Valentine’s Day candy, and you’ve bought your kids 2 hours of fun. It’s a tradition in our house to play minute-to-win-it games each Valentine’s Day. We spend a whole afternoon playing as many games we can think of with those tiny hearts. Vday candy is stackable and oh so cheap. Not worth eating, this is one food my kids can play with. $5 can buy you five bags of candy, and you can play games for 2 hours minimum. I’m not sure where else you can buy entertainment this cheap. Valentine’s candy is cheap: since you won’t be eating it, you can buy it at the dollar store for these games. Trust me; you’ll want to throw it away after this. Most will end up on the floor or with slobber on it. 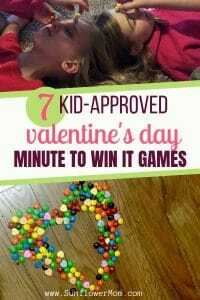 Kids love playing Valentine’s Day Minute to Win it games so much so; you won’t have any need for prizes. The games themselves are prize enough. Maybe have one bag to eat as you go. The more, the merrier. Each year, we invite a couple of other kids to come over and play Valentine’s Day Minute to Win it games us. However, I have played these games with my two kids, at school parties, and with their friends. It’s worked best when we played with four kids, but you can make it work with any number. After many years of playing Valentine’s Day minute to win it games with my kids, these are our top 7. Don’t be fooled by how easy they look. The fun is in the simplicity and the silliness. My kids have entered their teen years now, and we’re still playing these same seven. For the candy tower game, each player gets a pile of candy hearts and playing space (I gave them a cardboard heart.) Set the timer for one minute and see how can build the highest tower. When the timer dings, whoever has the tallest tower still standing wins. Your kids will want to play this one multiple times, as their tower will undoubtedly fall just seconds before the timer goes off. Warning – this one gets slobbery. Imagine a full bowl of candy hearts covered in slobber. You may want to save this game for last. But don’t let that thought gross you out and skip the game. “Scoop it” is my kids’ favorite game. Line empty cups (one for each player) in an even line on one side of the floor. On the other side of the floor have one big, community bowl of candy hearts. 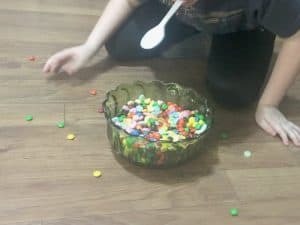 Players crawl on their knees and scoop candy hearts in spoons from the big bowl and empty as much as they can into their cups. No using their hands allowed. After one minute, whoever has filled their cup with the most hearts, wins. 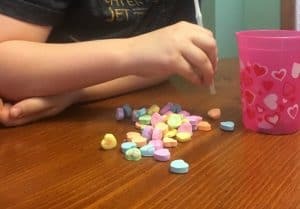 Give kids one minute to see how many candy hearts they can throw into their cups. Make sure the cups are sturdy enough to handle candy being thrown at them. You can place a rock in the bottom to secure them. You need at least four players for this game. 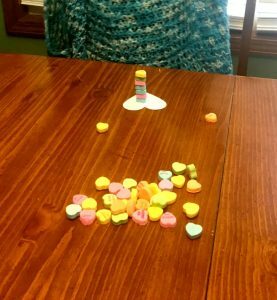 2 players lay on the ground and close their eyes, and two players stack the tallest tower of candy hearts that they can on the other player’s forehead in one minute. Then switch teams. If you only have two kids, you could see how many hearts they can stack in one minute on each other’s head. Then switch after one minute and see who had the higher number. Guessing the chocolate is a highlight. Grab as many different pieces of chocolate you can find around the house. You know you got it: mini-snickers, dove candy bar, semi-sweet chocolate chips, Hershey’s bar, mint chocolate, etc. Then cut each piece up into as many pieces as kids you have playing the game. Make sure you know what each piece of chocolate is but conceal it from the kids. You can blindfold your kids if you think they will be able to tell what each piece of chocolate is by the look and feel. Or give each piece to everyone at the same time. I usually have the kids write down their answers instead of shouting it, so it’s an even playing field. Go through all your chocolate and see who answered the most correctly. Put a pile of candy hearts next to each child and an empty cup and a straw. Set the timer for one minute. Kids have one minute to see how many hearts they can get from the table to the cup by sucking through the straw. Make sure the candy you selected doesn’t fit all the way through the straw, candy hearts work great. Lay your kids on the floor. Place a cookie or brownie on the child’s forehead. 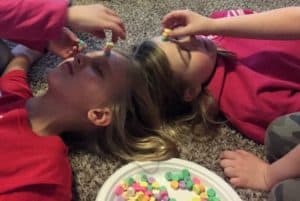 Give them one minute to see if they can move the cookie from their forehead to their mouth without using their hands. Be prepared to play each game over and over. Your kids will easily find two hours of entertainment over what looks like 7 minutes of games. Don’t be surprised if they ask to play the same games long after Valentine’s Day ended. Since most of the candy gets gross after a couple of hours, stock up at the dollar store so you can entertain your kids throughout February. For more Valentine’s Day Minute to Win It games, follow my Pinterest Valentine’s board.